As soon as the days get longer Berlin’s Open Air Cinemas open up for summer season 2011. A very prominent and unique cinema is “Freiluftkino Insel im Cassiopeia”. Located in an old train depot, Cassiopeia is one of Friedrichshains most famous clubs. Just a few meters from Warschauer Strasse at Revaler Strasse – also known as “Technostrich” (don’t ask 🙂 ) – it is the perfect spot to start your Open Air Cinema night. After watching a movie you can jump right in to the night-life of Berlin Friedrichshian. Next to the cinema you will find clubs like Cassiopeia, RAW, Suicide Circus, Astra Kulturhaus, M.I.K.Z. or Rosi’s. Also there are many good restaurants and cocktail bars around the corner at Simon-Dach-Strasse. Here you will find the program for May 2011. Most movies are “Orginal mit Untertitel”, which means the movies will be screened in their original languages (mostly English) but with subtitles. 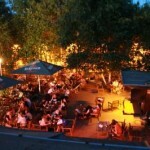 Entry is 6,50€ Cassiopeia Open-air cinema is just a few minutes from U inn Berlin Hostel. Just ask our staff for directions! This entry was posted in Whats up in Berlin and tagged 2011, Alternativ Berlin, Boxhagener Platz, club, Events, Freiluftkino, Friedrichshain, Kreuzberg, Kultur, Whats up in Berlin by U inn Berlin Hostel. Bookmark the permalink.